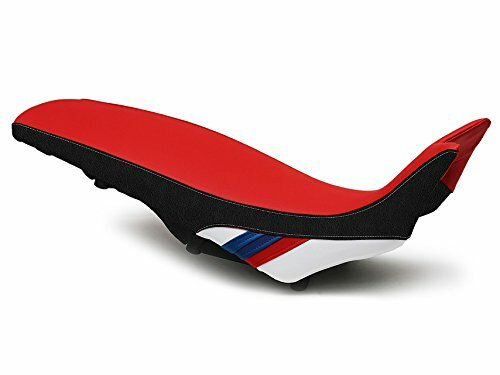 BMW F650GS F800GS 2008-2013 Luimoto Motorsports Seat Cover. The F800GS Motorsports seat cover features our Tec-Grip vinyl. Tec-Grip provides additional grip around the thigh area for high performance riding. BMW M stripes, carbon fiber and perforated-look vinyl complete the aggressive look of your F800GS. *This product also fits the 08-13 F650GS. Perfect fitment tailor made per order in Luimoto design shop in Canada. We sell covers only and does not include any base or foam. Luimoto's variety of synthetic suede, vintage leather look, and carbon vinyl will endure the most severe weather conditions. We have been online distributors since 2006 and carry the full Luimoto line. As with all parts it is recommended to use a professional help for installation. If you think we can improve this description or have comments, please feel free contact us now. The F800GS Motorsports seat cover features our Tec-Grip vinyl. Tec-Grip provides additional grip around the thigh area for high performance riding. Perfect fitment tailor made per order- production about 2 weeks.Does not include base or foam. Optional Luimoto Gold Gel Pad for rider- offers extra soft comfort. Raplaces the OEM cover. Excellent value for the money. If you have any questions about this product by Luimoto, contact us by completing and submitting the form below. If you are looking for a specif part number, please include it with your message.